Myrna Joyce Blake (Ridley) was born on July 29, 1934 in Montreal, Canada, to William & Eleanor Annie Adella (Bush) Ridley. She went home to be with Jesus at the young age of 84 on August 2, 2018 of natural causes. Myrna was the wife of the late Peter Michael Blake. They were married on July 5, 1958. Peter served in the US Air Force during this time and together they lived in Plattsburg, New York; Kaiserslautern, Germany, and Mary Esther, Florida. They retired to Mary Esther, Florida where she lived for over thirty years in the same home, while raising their family. Additionally, Myrna worked at the Hurlburt Air Force Base in Housing where she would “adopt” many young airmen with no local families. It was always crowded at the dinner table! 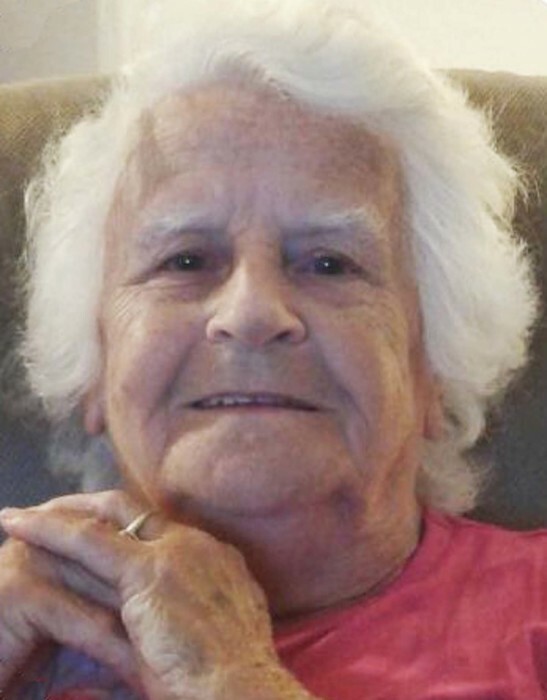 Myrna devoted her heart, soul, time and flip-flops to raising her four children and after they were grown, she helped raise her grandchildren and great-grandchildren. Myrna resided in Mary Esther, Florida until Peter passed away in 1995. She then moved to Colony House apartments until 2017, when she moved to Westminster, South Carolina to live with her youngest daughter Gay and her family. Gay gave mom love and all the care she needed and wanted and when it was time to move her to the hospital, Gay did that with a heavy heart. We are all so grateful to our little sister for everything and love her with all our hearts for all the unselfish things she did to help mom along her journey, while taking care of her own family. She is survived by 4 children, 9 grandchildren, 18 great-grandchildren, and 1 great-great-grandson. Joy & Robert Martinez (Stephen & Brittany Gay (Victoria & Cheryle), Shawn & Amanda Martinez (Elia, Emily, Shawn Jr. (Daime), Elizabeth, Aden, Cambria, and Madeline), William Lamb, Michael Blake (Jamie deceased), Peter & Patty Blake (Nicole & Alec Kibler, Angela Blake (Tristan & Peyton), Sandra & Brandon Watkins (Jayden & Bryson), Gay Lynn & Johnny Paul Singleton (Sarah & Justin Hulsey (Liliana, Tailyn & Jaxom), Chad & Erika Nelson (Jemma), Rebecca & Dorian Griggs (Wyatt & Emery), and Kristin Singleton. She also leaves behind her older sister, Mrs. Lois Barron of Canada and numerous nieces and nephews, her favorite cat, Callie and our family’s special friend Pat Bailey. Pat, our family would like to thank you for all you did for our mother. Nanny, we love you so much, you will be missed, tell Dad to call your bingo numbers when you see him. A celebration of life reception will be held after the services at 306 Hollywood Blvd. NE, Fort Walton Beach, Florida.